Stage 17 of the Tour de France was fun to watch, but was it fun to race? We asked riders throughout the peloton. TRIE-SUR-BAISE, France (VN) — Stage 17 of the Tour de France was fun to watch, but was it fun to race? The much-hyped 65km stage from Bagnères-de-Luchon to the Col du Portet delivered a compelling GC battle on the final climb, as Geraint Thomas (Sky) fought off Tom Dumoulin (Sunweb) and Primoz Roglic (LottoNL-Jumbo), Chris Froome (Sky) was dropped, and Nairo Quintana (Movistar) escaped for the victory. The stage was short, painful, and intense. It started with an unorthodox grid-style seeding — riders were arranged by their times on GC. Within a few hundred meters of the start, they hit the lower slopes of the Col de Peyresourde, the first major climb of the day. The peloton shattered on the climb, with the best climbers racing ahead, and the sprinters and domestiques fading. Quintana completed the journey in just over two hours. Last-place finisher Michael Hepburn finished 31 minutes later — still under three hours. Between these two bookends, the peloton’s working class raced over the three cols with different objectives in mind. For some riders, the day was an opportunity to contend for a stage win. For others, the day was all about making the time cut. Mollema was one of the first riders to attack on the lower slopes of the Col de Peyresourde, shortly after the peloton rolled out from Bagnères-de-Luchon. It was the second consecutive day of attacking for Mollema, who saw his GC ambitions deflate in the Alps. 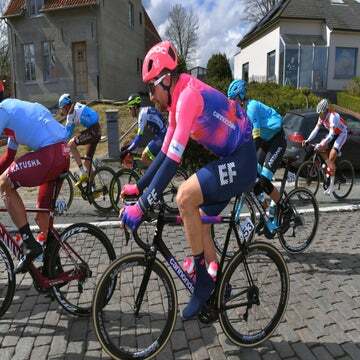 Mollema rode alongside a group of strong climbers: Alejandro Valverde and Marc Soler (Movistar), Omar Fraile (Astana), Pierre Rolland and Daniel Martinez (both EF Education First-Drapac), Franco Pellizotti (Bahrain-Merida), Adam Yates (Mitchelton-Scott), and others. Mollema was eventually reeled in on the second climb of the day, the Col de Val Louron-Azet. He finished the day in 31st, 10:50 back. Phinney (EF Education First-Drapac) knew that the day was not designed for him. His goal was simply to make the stage’s time cut, which was set at 25 percent of the winner’s time, more than double the usual cut for road stages. 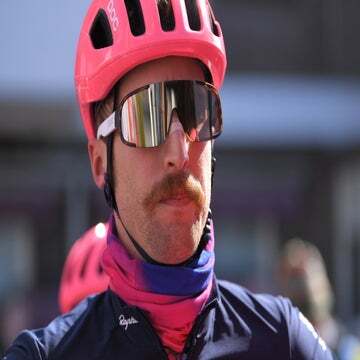 Still, that placed the cut at around 38 minutes, and completing the course in under three hours meant riders like Phinney had to maintain a stiff pace on the climbs. Phinney estimates he was dropped by the peloton within 500 meters of the start. He linked up with three other riders and began to pace himself along the race, eventually passing two dozen or so riders on the ascents of the Col de Val Louron-Azet. He finished alongside a sizable group in 122nd place, 25:48 down and well within the time cut. 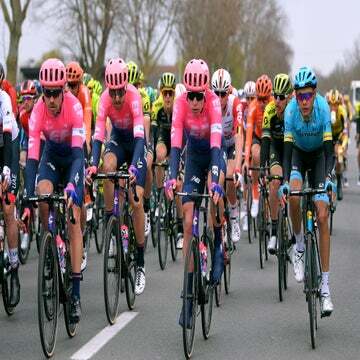 As he has done throughout this Tour, Poels came into stage 17 knowing his job was to ride the front in defense of Chris Froome and Geraint Thomas. Poels and teammates Luke Rowe and Jonathan Castroviejo rode to the front of the peloton on the rollout from Bagnères-de-Luchon and began to tap out a strong pace up the Col de Peyresourde. Poels dropped back in the group, then came back to the front, and helped lead Sky’s train into the base of the final climb to Col du Portet. Poels set the pace for the yellow jersey group for much of the final climb of the final climb. He was dropped after an attack by Steven Kruijswijk upped the pace. He finished 19th, 5:12 down. Rory Sutherland came into the stage as a domestique for Dan Martin, whose late-stage attack nearly earned him the stage win. Sutherland rode in the front group up the Col du Peyresourde, and was unhitched from the peloton on the ensuing climb after AG2R-LaMondiale upped the pace. The summit of that climb, theCol de Val Louron-Azet, was essentially the day’s finish line for Sutherland, who was able to ride to the finish with a sizable group. He finished 19:32 down on Quintana. Like Mollema, Sutherland said the unorthodox grid start did little to spice up the action. Sutherland said he supported the stage format, however, due to the action at the end. Craddock faded from the main group early, and then rode with Phinney and others to the finish. Craddock described his pace for the day as “full gas from start to finish.” He finished alongside his teammate in 125th place.